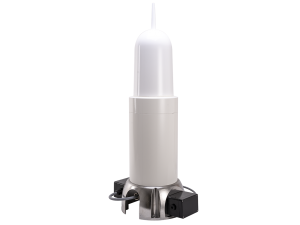 Orga’s heavy duty radar beacons (racons) are explosion proof and they fully comply with the acknowledged international (IALA and IMO) standards. Our racons transmit a Morse code character that’s activated by passing vessels. They respond to radar pulses transmitted by every vessel in the vicinity of your structure. For maximum flexibility and compatibility, our racons are designed to work in conjunction with the Navaid Central Control Panel (NCCP). Why do you need a radar beacon? Offshore structures like yours must always be easily “seen”, even when the weather and environmental conditions make this impossible in the physical sense. Orga radar beacons clearly and continuously announce the presence of your structure by first interrogating and then responding to radar pulses transmitted back by any vessel in the vicinity. No one knows better than you do that demanding situations call for products that are both up to the job and the environment in which that job has to be done. Our racons hit the spot on both counts. And it goes without saying that because they have to operate safely and reliably in hazardous environments, they are also explosion proof. Our radar beacons offer you the highly appealing combination of reliability, safety and low cost of ownership and power consumption. Moreover, to increase your efficiency, not to mention your peace of mind, built-in self-testing and calibration capabilities translate to low maintenance requirements. What’s more, to withstand the uncompromising environment in which you operate, our racons are fabricated from a stainless steel housing, fitted with an impact-resistant synthetic antenna dome with an anti-bird spike to prevent bird fouling.